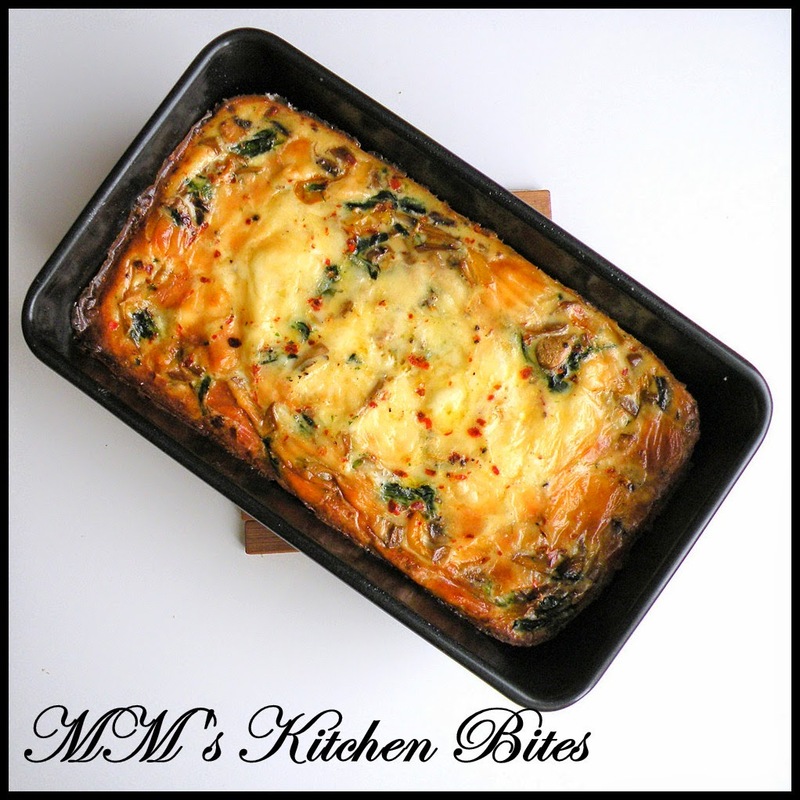 MM's Kitchen Bites: Eggloaf...my omelette's cousin!!! Heat a large non stick pan and cook mushrooms on high heat till all water is evaporated. Remove from the pan and spread on a plate to cool and dry. In the same pan now, add the bell pepper. Stir and cook till slightly soft. Remove onto the same plate as the mushrooms. Add the spinach to the pan now. Stir and let it wilt. Once the water evaporates, switch the heat and spread the spinach in the pan itself to cool and dry. Preheat the oven to 170 C. Grease a 2 lb loaf tin – ensure every nook and corner is covered properly. Once veggies have cooled down, mix them together and add salt and red chili flakes. In a large mixing bowl, whisk the eggs lightly with milk, salt and black pepper. Don’t over whisk, just till the ribbons break. Add the veggies to the eggy mix, stir and pour the mix into the loaf tin. Spread the grated cheese on top in the centre and into the oven for 35-40 minutes. Once done, the eggloaf would kind of pull away from the tin edge. Switch off the oven and let it sit in the oven for 5 minutes. The sides would brown up more than the centre but you need that to kind of keep the slices together. Remove from the tin, slice and serve with your choice of sauce or salad. The only thing that needs to be taken care of is to ensure that the veggies are completely dry or else your Eggloaf will “leak” and then it becomes absolutely unappetizing. Also, ensure the loaf tin is greased properly and fill the tin till ¾ full. I don’t use any oil to cook the veggies, you can if you want. Bacon doesn’t work in here, Ham does. Onion and broccoli work really well, tomatoes don’t unless you are using cherry tomatoes and placing them on top after about 10 minutes, zucchini works but too much effort to dry up the water – so skip it, potatoes work but then the slices don’t cut up so neatly– if you do decide to add, chunks no more than ½” big and crisped up well. 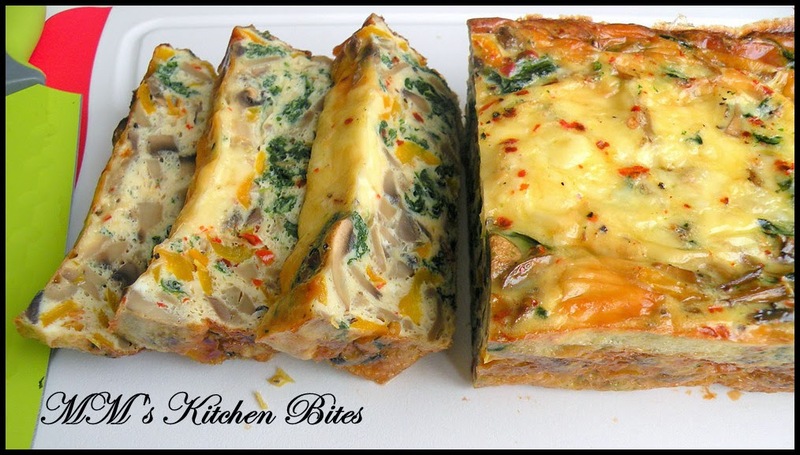 You can make smaller servings using muffin tin- takes about 20 minutes in the oven. Can I use frozen spinach that has been thawed and thoroughly drained? How about mushrooms from a jar? Would like to try with potatoes, onions and broccoli also!